Rolling the dice, it is not “Six”, it is “X”. Well we all know, “we can never hate an iPhone”. Bam! It is here again, lately Apple made its typical high profile declaration like a ritual straight from “Steve Jobs Theater”, billions of eyes were rolling already like wait, what’s next? To the point of madness, all rumors, hoaxes and swindles have already being crippled down since we can brightly see at the bigger picture. Yes, this year it is iPhone 8, 8 Plus and iPhone X. There are some highs and lows that we will discuss later, but today the stealer of the show is none other than iPhone X. Hey you all, articulate it correctly, it is “Ten”, not “Eks”. Take your caps-off and “Say hello to the future” right there in November. First things first, it is vigorously a high-end device which is wholly something you have not witnessed in an iPhone before, though the pricing of it is a big No-No, but you will love to spend all your pennies for it deserves a purchase, The only limitation is that you have it in Silver and Space grey. Talking about this big fish iPhone X whose top-notch feature is inevitable; the “Face recognition” (Face ID) feature to unlock your phone. Just look at the screen and there you go. It just needs your single glance, with 5.8 super retina display you would experience supremacy at its best. I personally love the rounded corners, totally a hot body you would love to grab. It comes in OLED screen giving vent to a brighter user experience for sure. Wireless charging is giving an extra oomph. Water/dust resistant as we expected. Extra blurred backgrounds to capture the breathtaking selfies. Portrait mode makes a (studio lighting) effect additionally. With 12 MP sensor, deeper pixels can be rehearsed, and color filters will actually stop you from downloading any lame camera filter apps. The cutest thing you will find in an iPhone X is “Animoji”, you totally can elevate a cute panda, or piggy in you and let your friends smile while imessaging you. It is Super-fast, stable, A11 bionic (smarter chip) super human intelligence. 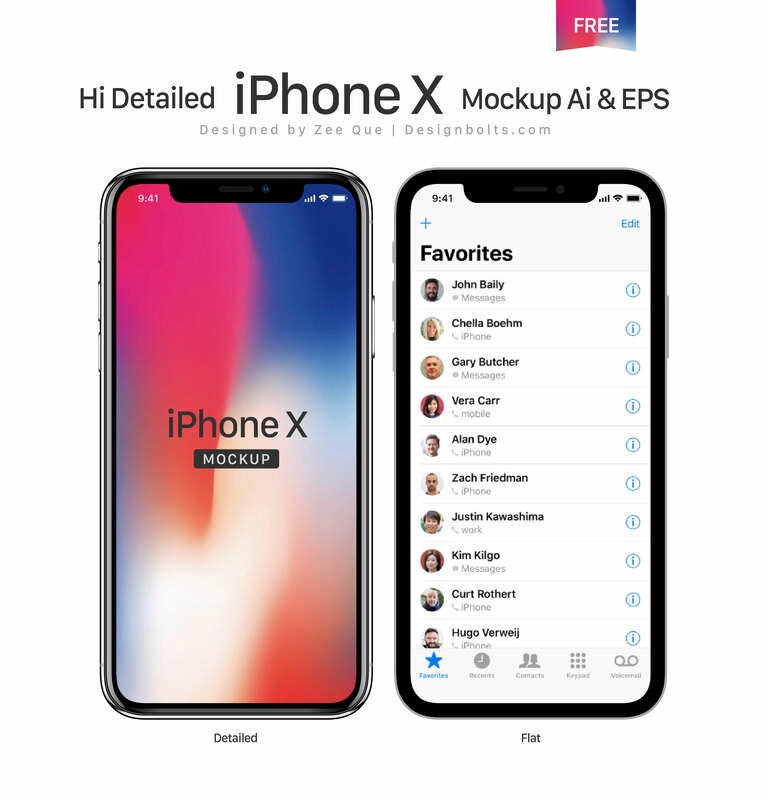 Down here I am putting forward a free Vector Apple iPhone X Ai mockup, you can use it personally or commercially to display iOS application design to your viewers or to your clients as well. Stick around for more detailed reviews coming your way in a while.